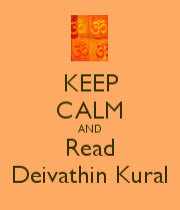 Thanks to Sri Ramesh Narayanaswamy for this wonderful share. This is a post on HH SarvaJnAtman (the 2nd acharya of Kanchi Kamakoti Peetam) writing called samkshepa shArIraka (संक्षेप शारिरका). When Adi Sankaracharya ascended the Sarvagna Peetham in Kanchipuram, many came to oppose him in debate. One of them was a boy of seven, named Mahadevan. He came from a village called Brahmadesam near Tirunelveli. His father was a great scholar of Purva Mimamsa and had defeated many Jaina and Boudha scholars in debate. During these debates, the child Mahadevan had also helped his father. Such was his attainment. After his father debated with Adi Sankara and accepted defeat, Mahadevan continued to debate for four days. Though he was defeated in the end, his brilliance caught the special attention and love of Adi Sankara. So when the child of seven accepted him as his Guru and asked to be initiated into Sanyasa, Adi Sankara was only too pleased to do so. He must have remembered his own being ordained into Sanyasa readily by his Guru Govinda Bhagavatpada in Omkareswara kshetra. 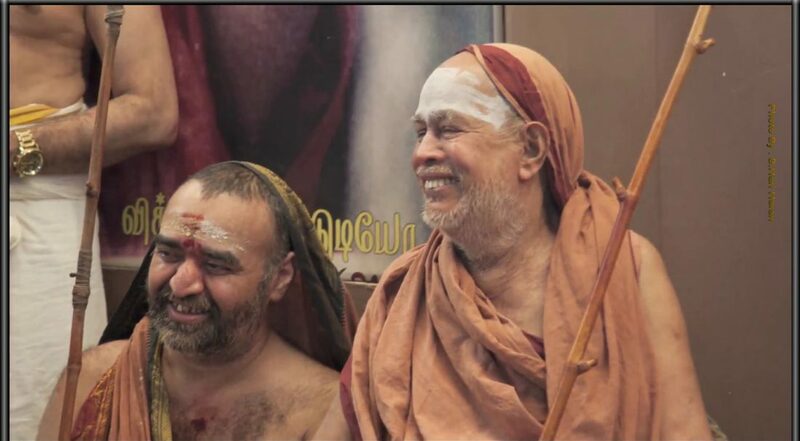 Later Adi Sankara appointed the young Sanyasi as his successor Sankaracharya of Kanchi Kamakoti Peetham, initially acting under the guidance of Sureswaracharya. 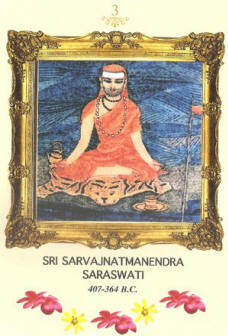 His Diksha name was Sarvagnatma. He wrote a beautiful book of more than a thousand verses to explain the Advaita Tatva enunciated by Adi Sankara in his Brahma Sutra Bhashya. The book was titled ‘Sankshepa Saariraka Bhashya’. It is one of the very few of such books in verse form on this subject and is an authoritative reference work. The Ghost is a reference to the pratibandhaka-s (obstacles) in attaining Self-Knowledge. The last but one sUtra in the third adhyAya of brahma sUtra-s talks about them. The sUtra (3.4.51) tells us that sometimes, strangely, even if Self-Knowledge arises we seem to be lacking the courage to accept It as the end-point! not return. The king was very disturbed, but a few other ministers, who were jealous .of Bharcchu, were very happy at his disappearance. As such they started a disinformation campaign saying that he died in the forest and was roaming the forest as a ghost. Everyone believed the story. Then, after some years, the king happened to go on a hunting trip to the same forest. He saw Bharcchu seated under a tree and in deep meditation. He clearly saw Bharcchu with his own eyes. But the King did not feel happy at finding his favorite minister. On the top of it, he fled from there in fright. Why? Because he thought it was the ghost of Bharcchu that he witnessed. Now, based on this, the shAstra analyses: Bharcchu, the prameyam is there. pramANam is giving pratyksha jnAnam. The king has no problem with his eyes. And the pramAta, the king, is there. So, the jnAna vRRitti is also produced –“There is Bharcchu.” And it is notparoksha jnAnam. It is aparoksha jnAnam (immediated). But the tragedy is that the king is not willing to accept it as jnAnam. He does not accept it as a valid fact. He rejects thejnAna vRRitti. And thus the jnAna vRRitti does not produce the phalam of Anandaat seeing his beloved Bharcchu. Not only does he not get Ananda, he is scared and runs away! Similarly, brahman the prameyam is there, shAstra, the pramANam is there, and guru reveals the fact… But either the knowledge does not arise or it does arise and the seeker hesitates to accept the jnAna vRRitti as jnAnam. This is a pratibandhaka. Sarvajnatman, calls it purusha aparAdha malina. The mind is with an impurity because of which jnAnam is not accepted as jnAnam. How to remove these pratibandhaka-s? We have to continue with shravaNam, mananam and nididhyAsanam. Understanding will eventually take place, though one cannot say when. How does it matter if the dates are incorrect? Agree. But targeting these correct dates have been a fashion for some people who are against Kanchi Math! And, we should never *ever* give room for that! Point out then and there, so people are not misled by opposing parties’ claims on the dates. The truth is – Acharya was born in Tamrabarani and attained siddhi at Kanchi after a pontificate of 112 years in the year 364 B.C. Whoever manipulated the picture (by editing the dates) should be taken up legally! Either the owner of the blog-post at https://www.advaita-vision.org/the-ghost-of-bharcchu/ removes the picture or puts up the copyrighted picture giving due credits in that write up; else it should and will be taken up legally for manipulation of contents. They have no right whatsoever to change the dates as they please by cropping a copyrighted picture of Shri Sarvajnatman Acharya of Kanchi Math and posing boldly as though they hold the copyright of the picture! The period shown in the portrait says 9th – 10th CE. 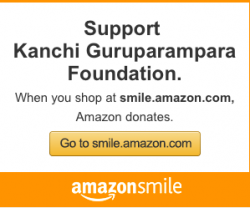 According to Kanchi kamakoti peetam. Adi Shankara period is 509 BC-477 BC. There must be some mistake in the portrait display.